Goodbye Architecture, The architecture of crematoria in Europe. The evolution of cremation technology. Over the past century crematorium techno­logy has developed into a highly advanced process in which every aspect of cremation is managed and monitored in detail. This not only improved efficiency but also allowed designers to place the technology even further out of sight of the public. Even having a visible chimney was actually no longer necessary. The current state of technology makes it possible to create bespoke installations. There are many possibilities in terms of setup and configuration. 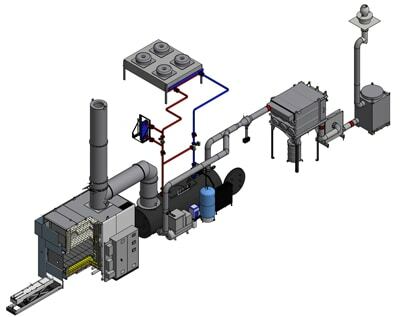 There are aesthetic opti­ons, various fuels can be used, there is a wide range of cremation filter systems and there are various possibilities to actively use the residual heat that is released during the cremation process tor heating or energy generation. Technical developments in the cremation process instigated the advent of cremation across Europe. Germany, Italy and France developed and used the first cremation ovens around 1850. The crematory ovens were coal-, wood- and later gas-operated. In the early days, there was actually a technical race going on in which Siemens in Dresden and Polli, Brunetti and later also Clericetti and Gorini in ltaly developed various cremation ovens. The advance of cremation was inextricably linked to technical innovation. Yet many of the people involved felt in­ comfortable with its emphatically technical and technological character and they were soon making attempts to disguise the oven and chimney in the design. A well-known example of this is the 1907 Hagen-Delstern crematorium in Germany, where Peter Behrens disguised the chimney as a tower. The association of ‘the transition’ or ‘the farewell’ with technology and in particular with cremation, has long been considered problematic. However, this is now changing at various locations in Europe. On the one handsome people experience the ‘hidden process’ as frightening or undesirable,and on the other hand there are more and more relatives who see the physical transition, the cremation in the cremation furnace, as an essential part of the farewell process. Both attitudes require an ‘approachable’ technology rather than a hidden one. It is all right tor technology to be used, but the tact that the committal room, the furnace and the operations they involve have to be presentable mean an aestheti­cizing of the technology is necessary. Over the past century crematorium techno­logy has developed into a highly advanced process in which every aspect of cremation is managed and monitored in detail. This not only improved efficiency but also allowed designers to place the technology even further out of sight of the public. Even having a visible chimney was actually no longer necessary. Environmental aspects of cremation is known as an option that is more sustainable than burial. The main reason for this is that traditional burials require a lot of space. In addition, dead bodies contain toxic substances that, with cremation, can be col­lected by means of a filter system rather than end up in the soil. Legislation in the field of emissions by cre­matoria is very strict in many European coun­tries, same times considerably stricter than in ether sectors, probably due to the emotional and ethical aspects connected with this ‘industry’. The result is that many modern crematoria are extremely clean. Residual substances that are potentially dangerous to the environment or health are filtered out and disposed of and processed in a responsible manner. Crematoria also allow an end-of-line solution for mercury abatement, for example, which cannot be achieved by burial. The use of fuel is an environmental aspect that has received increasing attention in recent years. Although the fuel efficiency of furnaces has increased, it takes a lot of fuel to reach the required temperatures. In addition to further improvement in the technology, research into user aspects and into the use of clean fuels therefore takes place as welt. ‘This involves innovative installations that work on biodiesel, (green) electricity and even hybrids to guarantee process security. The residual heat that is released during the cremation process is increasingly put to good use. In various crematoria it has long been used to heat the buildings on site, and in some areas, district heating is now gene­rated from the residual heat of crematorium ovens. Other cremation solutions can be heat storage of the used energy.